for a 1997 disc brake rear axle. I had a friend who was trying to get rid of a 1997 Explorer disc brake rearend. It had 4.10 gears and a limited slip. I said, "I'll take it!" And for the price I got it for ($450) who wouldn't? Well time dragged on and I finally decided that it was time to plant this pumpkin. I checked out the axles, brakes, clutches and gears. Everything looked good. I had to buy and install new C-clips but it was very simple. Note: Do not turn axle shaft without the pinion shaft in the differential or you will spend the next 45 minutes trying to get the damn side gears back into position. I made a couple of modifications to the brake lines so that I could use my braided steel brake line that was already in place. The '92 has the junction block at the centre of the rear differential housing. A '97 has the junction block on the left hand side. The hose from the frame, junction block and left hand caliper hose is all one piece. I used two right hand side caliper hoses. On the left hand side I drilled new holes for the bolt and alignment tab. The bolt is self tapping. I then bent up some new hardlines from the centre mounted junction block and ran them to the caliper hoses. I installed an SVO axle girdle. I believe that it is the T/A girdle with SVO cast into the cover. While I had the cover off, I installed a stud kit for the bearing caps. The studs were easy to install but it would have been easier to torque the nuts if I had a friend there to keep the rearend from falling off the jackstands. I managed to do it without dropping the rearend. The girdle was very easy to install and is very pretty compared to the dirty old steel cover. I simply followed the instructions that came with it. So now everything was ready to go. I blocked the front wheels and raised the truck on jackstands. After removing both tires, I removed the spare tire, while I was in there I removed the spare tire hanger. I then disconnected the rear swaybar and tied it up to the frame to get it out of the way. Next I disconnected the rear parking brake cables from the equalizer and pulled them out of the mount so they were free. Then I disconnected the rear driveshaft from the pinion flange and unplugged the rear Anti-lock connector. Now I loosened off the U-bolts. I did not disconnect the brake hardlines from junction block until I was just about to drop the rearend all the way to the floor. This was to keep the brake fluid from dripping everywhere, as much as possible. I put the hose and junction block on top of the frame to keep it out of the way. Next I supported the rearend with my floor jack and removed the U-bolts. I lowered the jack and dragged the rearend out from underneath. Now I stopped to have a Coke and some Popcorn Twists. 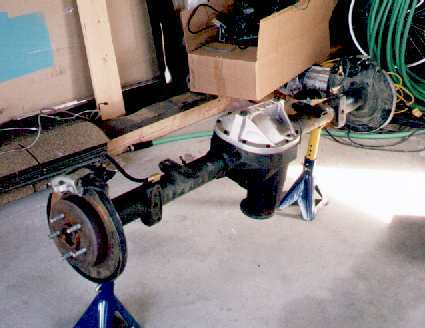 Installing the new axle was just as easy. I had a minor interference problem with the bolts for the caliper hoses and the Superlift spring perches. I solved this by installing a couple of flat washers on the bolts so they would not extend so far into the original spring perch. I jacked up the axle and aligned the Superlift spring perch as I went. 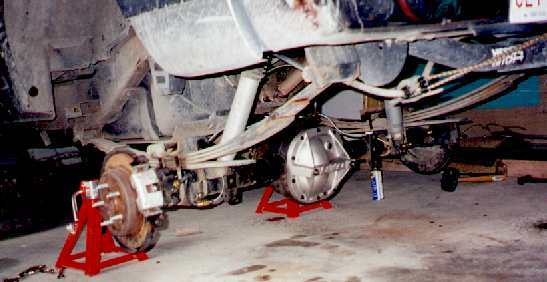 Once the axle was in place I installed the U-bolts and aligned everything before tightening them. Next I bolted the junction block onto the differential housing and connected the new hardlines. I then reconnected the rear Anti-lock connector. The next item was reattaching the rear driveshaft. I then ran the new parking brake lines through the frame mount. I had to get a new parking brake intermediate cable because they are different lengths from '92 to '97. There are also two small clips that are required to hold the parking brake cables in the correct position on the rearend. The last thing was to reconnect the rear swaybar. OK second to last. The real last thing was to bleed the brakes. I put the tires back on and lowered the truck back onto the ground. First I drove slowly down the alley to make sure everything was working. I checked for any leaks and then went for a real test drive. The improved stopping power of the rear disk brakes was impressive. There was a rubbing noise coming from the rear. I stopped and looked underneath. Nothing external was rubbing. I returned home and pulled the wheels off again. I then removed the rotors. There were a few small rub marks on the backing plates on both sides. Since the rearend was used, the backing plates had become dented and the rotors were rubbing on a couple of spots. It was nothing dangerous, just noisy and annoying. I used a 12oz "Wrench, General Purpose"(tm) to flatten out the high spots and went for a test drive again. The noise was gone. My truck is spring-over using the Superlift spring perches. 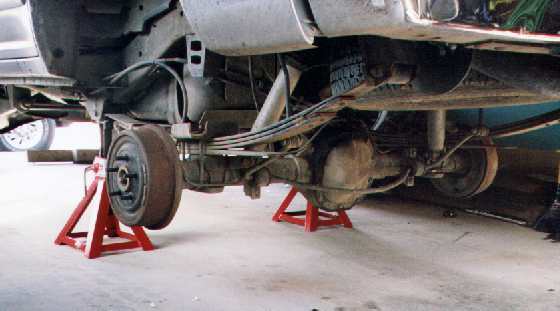 There are a few more steps required if your rear axle is on top of the spring. I did not have to disconnect my rear shocks, you may have to. Also a helper is definitely needed to lift the rearend off of both rear springs at the same time if your axle is in the stock position. This swap took me about 3 1/2 - 4 hours to do by myself, I took a lot of breaks between steps and it was a nice day so I wasn't in any hurry. I figure that the whole thing could quite easily be done in about 2 -2 1/2 hours by two people. Remember to check and double check everything to make sure all fasteners are torqued to spec. Be sure that you bleed the brakes and refill the master cylinder. Do not cut any corners with brakes and suspension. Your life and the lives of your passengers depend on it. AmericanTrucks takes Ford truck performance to the next next level with high-quality performance truck products at low prices.